Better Off Friends asks the age old question, can a guy and girl ever really be just friends? Levi and Macallen are best friends who have a great friendship which is so strong that they wonder- should they try to be more than friends or will things become too complicated? 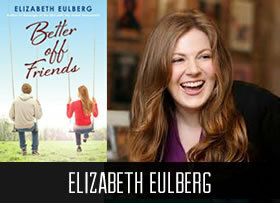 Elizabeth will be in Houston at a FREE event, Teen Book Con on Saturday, April 26 at Alief High School.